British winters are long, dark and dreary, and by mid-January, Christmas is already a distant memory and seasonal cheer is in short supply. It’s no wonder that we start dreaming about sun-drenched piazzas and sandy beaches. But while the beginning of the year is the most popular time to book a holiday, it’s also when many of us feel like our budgets are under particular pressure. With that in mind, we’ve come up with nine top tips for booking a holiday on a budget. When you’re deciding where to go, take into account local prices in your destination and the exchange rate, as well as the cost of flying there. It’s sometimes worth paying a little more for flights if things will be very cheap on arrival. 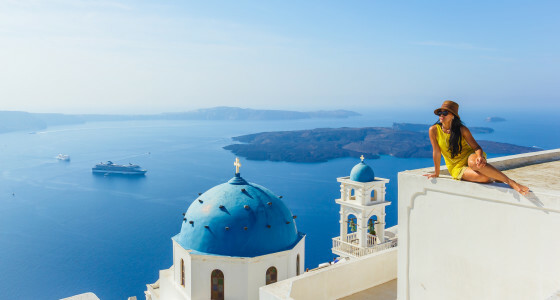 Low-cost locations for beautiful holidays include Greece, Bulgaria and Montenegro. If you’re going further afield, take a look at Thailand, Cambodia, India and Vietnam. Unless you have school-age children or a job that means you can’t be absent during term time, avoid booking a trip during the school holidays as prices are likely to be much higher. It’s usually smart to avoid public holidays too, remembering to check for any special events in your destination country as well as UK bank holidays. Travel comparison websites like Skyscanner, TravelSupermarket and Kayak can help you find low-cost flights, and if your timings are flexible you can toggle the dates of your arrival and departure to find the best deals. Airline prices can fluctuate a lot, so these sites let you set up price alerts so you’ll receive an email if your chosen flights go up or down in price, so that you can buy at the best time. If you’re going further than Europe, you’re likely to find that indirect flights are more cost-effective than direct flights, but make sure you have enough transfer time if you take this option. When you’re snapping up a super-cheap flight from a budget airline, be sure to factor in the extra costs. For example, hold luggage isn’t usually included in the price of budget flights, so add this into the calculation when you’re comparing deals. If you do want to bring a big bag, it’s usually cheaper to book this in advance. EasyJet, for example, charges £13 to £30 for a 20kg bag booked in advance, but you could pay up to £45 if you don’t book it before you get to the airport. When you’re comparing flights, you’ll often find that a crack-of-dawn departure will be the cheapest option. But before you buy, consider whether this saving will be eclipsed by other costs. For example, will you be forced to take a taxi because it’s too early for public transport to get you to the airport in time, or will you need to pay extra for early check-in at your apartment? On balance, paying a few pounds extra for a slightly later flight could actually be more economical. If you’re driving to the airport, it’s usually much cheaper to book your parking in advance than to pay on arrival - in some cases it can save you hundreds of pounds. Plus, there are many long-stay car parks serving the major airports, so you could look around for somewhere cheaper than the official airport car park. Do your research though, and make sure that the car park you choose is secure and offers easy access to the terminal, for example a free 24/7 shuttle bus. A wealth of online reviews, pictures and virtual tours now mean you can make a really informed decision about accommodation, and it’s worth spending some time weighing up your options. AIRBNB TRADITION No. 07: Soak in the view. Show us how you're starting the new year using #Airbnb. Renting a self-catered house or apartment can be much cheaper than a hotel, especially once you’ve split it several ways if you’re travelling with a group. Plus, you won’t need to spend so much money on eating out when you get there, as you can cook for yourself, or at least prepare basic meals at your base. Property rental sites like Airbnb or rental sites specific to the local area are a good place to start. Or, if you’d be happy to have guests in your home while you’re away, you could even consider a home swap, using a platform like HomeLink. It’s also worth taking a look at hostels, which you can compare on sites like Booking.com. Not just for money-saving backpackers, many hostels offer really pleasant, low-cost private rooms as well as dorms, and you’ll usually get access to cooking facilities. When you’re paying for accommodation and other aspects of your holiday online, it can be a smart idea to use your credit card, as credit cards come with consumer protection that debit cards don’t. If the seller goes out of business, for example, the Consumer Credit Act means you can claim back the money you’ve lost. However, remember to pay off your credit card as soon as possible, so that you don’t get hit with high interest charges. If you’re still struggling to make the numbers work, read our suggestions of some small switches you can make to save money. We’ve suggested you put the extra cash into your pension, but maybe you’ll save enough for your holiday, too! What are your top tips for a low-cost holiday? Tell us in the comments at the bottom of the page.